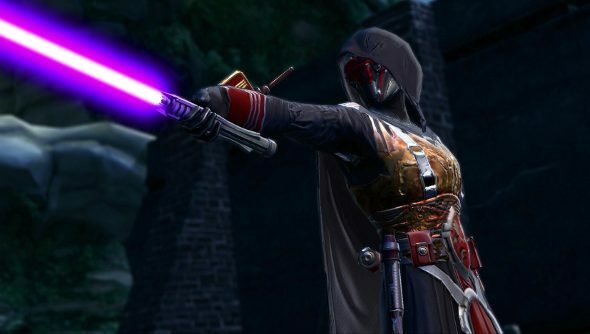 Star Wars: The Old Republic’s getting another expansion, and it’s all about Knights of the Old Republic’s Revan – who’s popped up a few times in the MMO, along with the delightful HK-41, but hasn’t been focused on until now. Shadow of Revan pits both Republic and Imperial forces again the titular villain-turned-hero-turned-villain-again. He’s put together an army of loopy Revanites with one goal: demolish both factions and probably other megalomaniacal stuff. Along with the quest to thwart Revan, expect new Flashpoints and Ops; travel to two new worlds: the pirate paradise of Rishi and the jungle world of Yavin 4, where the Rebel Alliance ends up in the distant future; and earn new gear and reputation rewards. But to get all that – and the five new levels – you’ll need to buy the expansion. Pre-ordering it will net you early access, but only if you do it by November 1st. You’ll also get the first digital expansion, Rise of the Hutt Cartel, for free. With the expansion comes a game-wide update, affecting all players, which includes an overhauled level system that replaces the old skill trees. The Discipline system removes the necessity of picking skills and working your way down a tree, instead give players different paths with powers that unlock automatically. Early access kicks off on December 2nd.